Yes, there was a Pride event in Bolingbrook last June. Yes, we were one of the sponsors. Now there’s video proof! 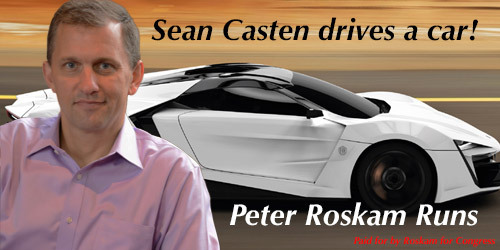 Sources inside Representative Peter Roskam’s campaign say the campaign will run a haunted attraction based around his Democratic opponent, Sean Casten. Based on “Hellhouses” run by Christian ministries, the attraction will be called “Casten you to Hell.” It will open October 1st and run through Halloween. 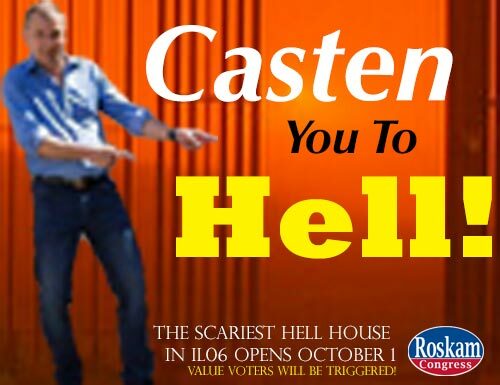 Will this graphic promote Rep. Peter Roskam’s ‘Hellhouse’? The receptionist walked into a meeting room. Roskam and eight other men were sitting around a table. “Wow! I’ve felt God in Wheaton, but—but.” The man started speaking in tongues. The rest of the staff started speaking in tongues. Representative Peter Roskam’s campaign is undeterred by one of their Facebook ads getting a “Pants on Fire” rating by Politifact Illinois. A web ad allegedly produced by Rep. Peter Roskam’s campaign. “You’re supposed to say, ‘Sleazy Casten.’” said another staffer. Flush with money from political action committees and support from the Congressional Leadership Fund, the Roskam campaign is aggressively attacking Casten. The Cook Report rates the race a tossup, and Bobby says they are working hard to change that. Roskam pressed a button and put down the headset. Hosted at the Village Hall, attendees divided their time between speakers and the festival outside. Swain proposed that Bolingbrook mayors should be elected to one 40 year term. He also suggested that trustees should be appointed by the mayor to a ten-year term. A mayor could then reappoint trustees at their discretion. Mayor Roger Claar and the trustees who are members of Claar’s Bolingbrook First party smiled and nodded during the speeches. Claar reached into a cooler and pulled out a frozen Asian Carp. He extended it towards Jaskiewicz. “What are you doing?” asked Jaskiewicz. Hello. If you have been a long time reader of the Babbler, then you’ll remember that I used to write the Skeptical of Skeptics column. Today, we’re part of the Freethought Blogs network, and the skeptical movement is just a fraction of the threat it used to be to open-mindedness. So I don’t need to write that column anymore. Instead, the editor was kind enough to let me stay on as a political pundit. Thanks, Sara Langston. Which political party do you want to win the 2019 Bolingbrook Trustee Election? Based on this poll, it looks like Bolingbrook United is in a strong position heading into the election. Bolingbrook Pride Reborn is going strong considering they haven’t run a candidate since the 1980s. If they can get on the ballot, it’s possible they could form an alliance with Bolingbrook United and take over the village board. Despite the name, The Roger Claar party isn’t affiliated with Mayor Roger Claar. Usually, Claar kicks them off the ballot, and the courts affirm his decision. If they get on the ballot for 2019, then they could take at least one seat from Bolingbrook First. We could end up with a Board meeting where these two parties debate which is the most supportive of Claar. That’s probably why Claar has raised over $300,000 for his campaign fund— He knows he will need that much to support the Bolingbrook First party and to maintain his lifestyle. Of course, things could change when the candidates are announced sometime in December. Until then, this poll will inspire months worth of columns, most of which you can only read in the print edition of the Babbler. It’s going to be a fun election season next year. From the Webmaster: This poll is based on a convenience sample of five people on Twitter. Assuming everyone who participated was a Bolingbrook resident, the margin of error is ±43.826%. Alien Antifa fighters dealt a humiliating defeat to members of the Proud Boys who tried to violently end the occupation of Bolingbrook’s Clow UFO Base. The twelve members gathered outside Clow Airport, wielding wooden sticks. They were wearing helmets, black and yellow polo shirts, and homemade armor. Their leader, Clint, read a statement to this reporter saying that “space aliens with ties to space Muslims and anti-Western ideologies” had captured Clow UFO Base. The Cook County Democrats, he claimed, were “preventing Bolingbrook’s Mayor Clark (sic) from doing what needs to be done.” He also called Bolingbrook a “Space Alien Sanctuary City” and said his group would free the residents from “Illegal Space Aliens.” Clint added that the Proud Boys, while having ties to white nationalists groups, were not white nationalists, but were pro-Western Civilization. “We can’t help that the West is white,” said Clint. The men then marched in formation towards the airport chanting “Space Jews will not replace us!” and “Islam is a virus from outer space!” When they reached the flag poles, the members started defecating in their clothes. Clint ordered them to start reciting brands of breakfast cereal. Seconds later, a Martian Colonial battleship hovering over the airport de-cloaked. The Proud Boys angrily waved their wooden sticks at it. The word “Antifa” appeared on the craft before the crew fired a cognitive dissonance ray at the protesters. The men fell to the ground screaming. After the attack, Clint ordered the Proud Boys to run away. They were then arrested by the Bolingbrook Police. After the protesters showered, and a cleaning service washed their clothes, Mayor Roger Claar met with them. According to sources, Claar said he would release them since he didn’t to “deal with the headache of Internet racists.” He added that all the protesters were now banned from Bolingbrook, and would be arrested if they ever came back. The Proud Boys refused to be interviewed after being released from jail. One was overheard saying, “We should have gone to Washington. They needed more people.” An email to their website was not returned. A receptionist for Claar said he was out of the office, and that there was already a line of people waiting for him. Rep. Roskam: My pants aren’t on fire, lying Sun-Times! Caine, a member of FtB, lost her battle with cancer this week. Honestly, I mainly knew her through the back channel. I knew she had cancer, but I didn’t realize how severe it was. I feel for her many friends and followers I also feel sad that I will never get to know her better, or ever get to meet her in person. That opportunity is gone. Humans are fortunate, in that we appear to be the only animals on Earth that can perceive and appreciate the universe. Our advances in medicine and science have extended our lifespans. Still, at least for this week, it feels like there’s never enough time. So I’ll try to make the most of the time I do have. However long that is. Many Bolingbrook residents claim to have met weresunks canvassing for Republican candidates. “I told them I was going to call the police,” said Dolly. “I swear, one of them turned in to a 10-foot tall man-skunk with sharp claws. It said calling the police was the wrong answer. I slammed the door and locked it. It sprayed the door and the front yard! I thought tiny skunks were bad.” Dolly added that she had to spend a fortune on peroxide, baking soda, and liquid detergent to deodorize her home. According to Shannon, the canvassers confessed to being wereskunks, and they were really working on behalf of Mayor Roger Claar. The wereskunks said that if the Republicans swept all of the races on the November Ballot, Claar would continue to ban garbage toters. Garbage bags were more manageable for their cousins to open than garbage toters.